Un livre que je remercie C. de m’avoir prêté il y a bientôt un mois lors des quatre jours aux Sauvas. Je l’ai lu et il m’a fait le même effet (un bouillonnement de jubilation, pas d’autre mot…) que celui de Natalie Goldberg, Les italiques jubilatoires, ce qui n’est guère étonnant compte tenu du fait que Natalie Goldberg a justement écrit la préface de Life, Paint and Passion – Reclaiming the magic of spontaneous expression (Michele Cassou & Stewart Cubley). Sommaire, avant d’en livrer ici quelques extraits qui m’ont émue, touchée, bousculée. If it’s already painted in your head, why paint it? Be careful, they mifght teach you something! Abstract forms or concrete images? If you do not listen to your intuition, it will stop talking to you! You are not your painting! P. 9 : This is the purpose of painting process. It takes you back to a more natural way to sense yourself, to be yourself. It makes you sensitive and alert to the habit of judging and shows you how inappropriate it is. It reveals boredom as an avoidance and fear of feeling. P. 11: Wherever you are is the entry point. To do the simple thing with integrity – a point, a line, ascribble, a rough image – is the most creative response you can make. P. 12 : Creation is never about changing yourself; it is about meeting yourself, probing deep into your own core. […] You step into the middle of yourself and move from there. P. 16 : Talent is not a gift given to only a few. Talent is like the sun shining outside the window: it is there for all of us – all you have to do is pull back the curtains and let it in. P. 34 : How can any sense of personal preference be compared to beauty itself? It is as a candle to the sun. Beauty is in the honest brushstroke that manifests without choice. P. 36 : Why do you make you desires so important? […] There is much else! There is what you need – all that which is pushing from inside to be born, all that you may think is too strong, too childish, too different, unreasonable, or strange. Under the superficial « I want » lie all the spontaneous urges to paint, and they require your attention and your honesty. P. 43 : Your body knows the answer to these questions at each moment. Once you are free of the limiting idea that you need to know what you do, you can sense directly, allowing all sorts of spontaneous images to arise. P. 44 : Dare to floow what your body says and see where it leads you. P. 47 : We have to ability to sens and act directly, without thought. This ability is inherent and instinctual, but has been buried deep by education and acculturation, usually not surfacing except in moments of great stress or perceived danger. Yet it is there if we listen. Its voice may be quieter and less dramatic than the loud clamor of reactions and opinions, but it has an intelligent persistence that can guide us. P. 51 : The spontaneous imagination is often disregarded as inconsequential. It is as if we deem these fleeting inspirations to be frivolous noise. On the contrary, it is the judgments and barriers we erect that are the frivolous nois, not the images that come to us. If you treat your inner life seriously and with respect, you begin to see that there is an intelligence behind the seemingly random suggestions it presents, and that it is in your own best interest to follow them. P. 52 : There is nothing more satisfying than, to come from that source, that place that has no opposite because it is a place of being. P. 54 : I will never forget the impact of her words; she awoke from a nightmare. Her statement showed me that all judgments are relative and subjective. My painting could be beautiful if it were looked at differently. P. 56 : The outcome of a painting has to be viewed on the ground from which it was created – its aliveness, its energy, its vulnerability – in order to be appreciated. P. 57 : What are you afraid of as you face the paper? Of making a mess? Of attempting something that may appear primitive and unsophisticated? Something that might reveal your ineptitude? Are you afraid something dark or foreboding might emerge? Or silly and superficial? Try it and see! […] The mind is a thief: it wants to steal your process. so whenever it tells you anything about your painting, remember who is talking. P. 62 : You are not a « painter » – you just paint. P. 67 : To use the energy of violence for creation instead of destruction is a fascinating process. We are afraid we won’t be able to contain these intense feelings, that we will start screaming, destroy the painting, or even hurt people. […] To react to it in the real world wouldn’t be good, but to express it, to let it run through us, to see its roots, to free it from its cage of the body-mind, how could that be dangerous? If anything is dangerous, it is not to paint it. P. 68 : Maybe this « bang bang » that we worry about is just a release of pleasure, like the cracking of the seed. when a seed sprouts, it’s a violent process. The skin breaks and splits in two. something dies and something is born. Anytime you paint a strong or violent image, you may be expressing that part of yourself that’s opening in order to let the new emerge. P. 70 : But feeling and painting is different. To feel and paint means to let the feeling sink deep into your bones, and then to start from that feeling without habing to think about it. Feeling paints itself; it doesn’t need you! 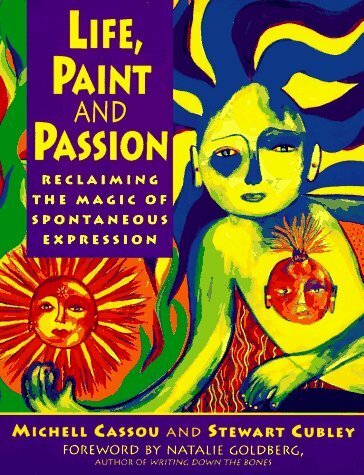 P. 73 : To create is to allow that deeper voice within us to emerge through instinct. Spontaneous expression has an expansive intelligence that is nonlinera and nonlogical, much like our dreams. P. 77 : Feelings are stored in the body. When the intuition is successful in uncovering new perceptions, areas of the body become unlocked. P. 81 : If you do not listen to your intuition, it will stop talking to you. your intuition is like a sensitive friend. If you question it, censor it, judge it, it gets hurt and becomes silent. P. 82 : The fuels of intuition are integrity and courage. Harmony is its moving force. Et puis, finalement, je termine sur ce dernier extrait. Parce qu’il y est question de courage (merci le tirage du jour) et d’harmonie. Et que j’aime ça. Cette entrée a été publiée dans Carnet de Lectures et étiqueté créativité, expression spontanée, Michele Cassou, Natalie Goldberg, Stewart Cubley . Marquer le permalien . Ces extraits m’ont convaincue de l’ajouter à ma liste d’ « indispensables » à mettre dans mes cartons cet été ! Mille fois merci pour cette découverte, merci pour cet avant goût ! Ravie que cette découverte te plaise !